Mark and Shanie welcome you to join them in the tranquillity of Altea, watch the world go by and relax in Rascals Café Bar. 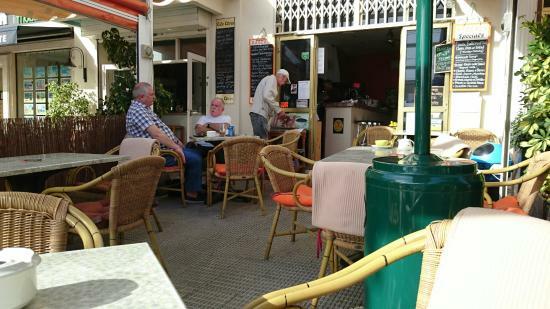 You can find us just along from the port of Altea opposite the Ampitheatre, on the number 10 bus route from Benidorm. We offer home cooked freshly prepared food, popular favourites are Rascals Honey Roast Ham, jacket potato with various fillings and our English breakfasts. Not forgetting of course our Sunday Roasts! Have You Tried Our Chocolate Toasties? “We have been coming to Altea for over ten years and probably have eaten in all the restaurants. Rascals changed owners last year and we have had numerous breakfasts there. Full English, Veggie breakfast, fruit and yogurt, scrambled eggs etc.etc. And have never had a bad meal. They are very friendly and always are welcoming. We would highly recommend this place if you want to eat English food”.